Your horse will work happier and perform better with massage therapy! With over 15yrs experience as a Certified Equine Sports Massage Therapist and with over 5000 massages successfully completed. I will help your horse function at his or her best ! What is Equine Massage Therapy ? Sky uses a combination of deep tissue massage, energy work, acupressure, T-Touch, myo-facial release and stretching – to release your horses muscle tension, tightness, spasms and knots. This then allows your horse’s muscles to function at their best. 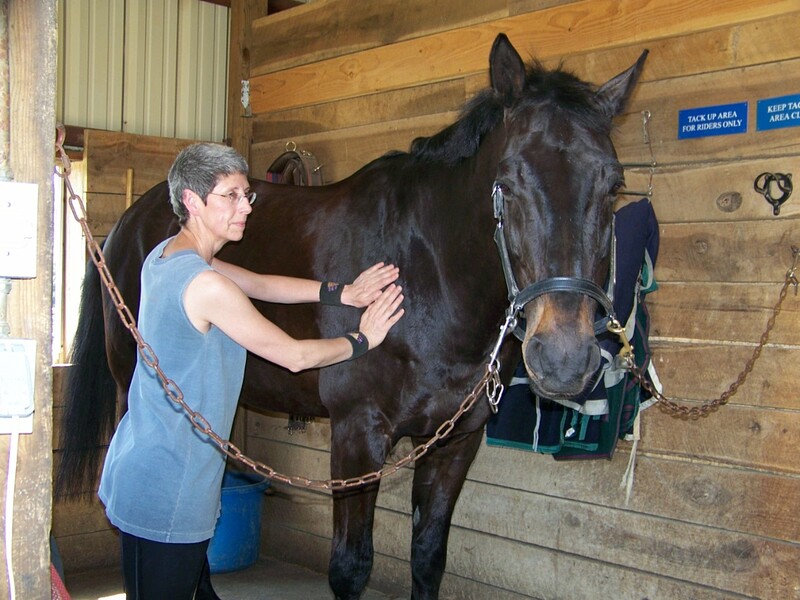 What Horses Can Benefit From Equine Massage Therapy ? Performance horses of all riding disciplines and levels of work. Horses currently in training at any level. Horses who work at irregular intervals. Horses with new or old injuries or joint problems. Horses on stall rest, limited work or turn out. Horses that are highly strung or tense – such as thoroughbreds. All of these situations can contribute to muscle tightness which causes impaired muscle flexibility, discomfort and muscle strain. This can lead to muscle resistance, poor overall performance and unwanted behavior issues. How Does Equine Massage Therapy Help These Issues ? Equine Massage Therapy will release your horses muscle tightness & tension, allowing your horse’s muscles to become more flexible and supple. Improved performance, improved attitude toward work and a much happier horse are the result ! How can I Tell When My Horse Needs Equine Massage Therapy ? If your horse displays any of the following behaviors or has any of the following Symptoms – then your horse is trying to tell you that he / she needs an Equine Massage Therapy session ! Displays resistance, not happy in his / her work. Sore back and / or saddle / girthing issues. History of injuries and / or joint problems and / or arthritis. Bucking with lead changes, swapping leads. Attitude Problems or “Off” for no reason. The Bottom Line: Is It Worth It to Get an Equine Massage Therapy Session for Your Horse ? Yes ! It’s never too late to help your horse be more comfortable, more flexible and happier to work with you !